We Filipinos love happy endings and we’d like to see one at the end of 2010 election season. But, so far, many appear not to be in a celebratory mood even after the Commission on Elections started announcing official results at the national level. Noynoy Aquino appears set to be the next president, capturing 40 percent of tallied votes, but he and his fans have not been triumphant in their statements. Aquino’s foes led by Manny Villar (my candidate) have graciously accepted defeat and promptly congratulated him. 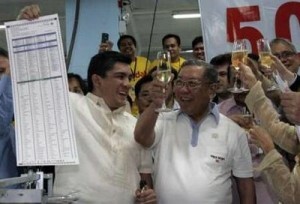 Richard Gordon said Aquino scored a “spectacular victory”. Only Joseph Estrada is left fighting, so to speak, but no one cares. Still, no party to celebrate the Aquino victory. Why? There are many things to be happy about: The quick tallying of votes by the Comelec, the quick proclamation of winners in some local posts, the quick and gracious concession speeches made by Aquino’s foes. These however don’t appear to be enough to make us happy. We may not be happy may be because it was all too quick and we don’t know what exactly happened. All throughout the day, there were PCOS machines malfunctioning, wrong ballots, dead persons on the voters list but living ones cannot be found, the inexplicable long lines, and the like. In some areas, the Comelec proposed that a failure of elections be declared. The small problems became so big that the Comelec had to extend voting until 7:00 pm. Meanwhile, the operational and functinong PCOS machines apparently did their job, which is most probably the reason why the Comelec has been able to quickly release official tallies. Perhaps we are just cautious. The Aquino camp still awaits the results in the vice presidential race where rival Jejomar Binay is leading perennial survey winner Mar Roxas. The senatorial race is still not over because the last two or three of the 12 winning candidates may still change. Media meawhile has been a bit remiss in reporting on the bulk of local races. Or perhaps we are skeptical of the credibility of the results tallied by the Comelec? Maybe we still don’t want to celebrate because the Comelec (and Smartmatic-TIM) has long denied us adequate information and access on the automated election system (AES) from Day One so we would know for sure that each vote was properly counted so the results would be credible. Besides, the Comelec itself was/is not the paragon of credibility, with or without the AES. It appears to me that the Comelec is trying but not succeeding in hypnotizing us into just accepting the super-fast release of tallies without giving us explanations on how it arrived at those figures, where the votes came from, etc. Precisely the same questions many have raised as the Comelec imposed this AES on us. If we are to believe what has been happening since Comelec started to release results, we just had the “cleanest” and “most honest” elections. No news on how the Comelec addressed all the precinct-level problems #juanvote and mainstream media reported throughout the day. No news on private armies (i.e. Ampatuan) that were supposedly disbanded to unleash voters who are routinely harassed into voting for warlords. In the partylist race, which the Comelec bungled by accrediting and keeping the administration-instigated groups and personalities, we hear no meaningful or profoundly news. No news either on how and how soon the Election Day glitches were addressed, or how many were disenfranchised. Maybe, that’s it: Filipinos wanted not just quick elections: We wanted quick and credible elections. And the Comelec has only been able to give us a quickie. Definitely, that’s not a happy ending. I believe COMELEC needs all the encouragement but, of course, we need to push it to work harder and make this elections credible. Yes, I agree that COMELEC should be a bit more transparent, regarding results. At this point, I just have to hope that having “quick” elections decreased the possibility of fraud occurring simply because there wouldn’t be enough time to commit it. But I fear the disenfranchisement of several voters can still put to question the results of canvassing. What if there’s sufficient number of disenfranchised voters, who could have voted and made a difference in the turnout of results? However, we shouldn’t put the blame on COMELEC alone for the low voters turnout (or lower than what is expected). How I wish some of the voters have been more persistent about being able to vote when they found out their names weren’t on the list, or that the PCOS machines in their precincts malfunctioned. It is imponderable why the COMELEC cannot identify the results by region — they only have totals and cannot say where they came from. This is a vital cog to the credibility of the results. I seem to remember that in the discussion of the “defects” of the system, it was mentioned that the digital signature of the ERs was removed. What this means, apparently, is that when the results are transmitted, the source will not be recorded. In other words, the COMELEC and the PPCRV will get electronical results but not know where it came from. I did not realize the impact of that till now. Now we have results without knowing the source. Incredible! I was waiting for them to have some kind of a map on the wall that would be color coded to indicate that the areas from which the results have been received. I was expecting to see some kind of a grid presentation of the results showing the areas. Maybe I’m wrong because of TV5 they were attempts to show the results by region — but their electronic data kept tripping, I gave up on watching it. If the info is in fact available (else where would TV5 get it? ), then the programmers at COMELEC and PPCRV, were not thinking well if they did not capture the transmitted results by area and instead just lumped it all together. Stupid, I have to say. After getting “quickee” results — now we wait for the “manual” canvassing. Hopefully these will not differ. And where are the findings of the 30% manual audit anyway? your caption seems incomplete. Smartmatic is likely celebrating too. And why not? It’s no mean feat assembling enough techies to reconfigure 76K CF cards in 2 days or so. But it’s a little like celebrating after you clean up your own “mess.” I agree with Prudence on the issue of transparency. There is also an issue of hubris on both sides of the automation debate, but perhaps that sleeping dog is best left as is where is.